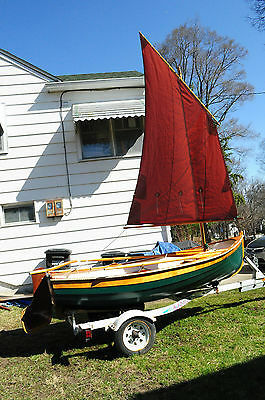 Ian Oughtred designed, 10' 6" Acorn sailing dingyI have the original plans which are included. The boat is on a trailer that was designed to fit this specific boat. The stem to stern water proof cover is custom made for the boat by Muskegon canvas. The sail was also made specific for this boat according to the sail plans, also included. Dagger board is accented with purple heart wood, oar locks are brass, oars, and rudder are included. Contact information: You are welcome to reach me via email through ebay. Interested parties are welcome to speak with the builder. I can put you in contact with him who would be happy to answer all of your questions. I am happy to offer free delivery within 250 miles of Ann Arbor, MI. Delivery outside of that area can be arranged for a fee, otherwise pick up is in southeast Michigan. Payments can be made through pay pal, certified check or cash. No delivery will be made until full payment has been received and verified. This vessel and trailer are as described above and shown in the photographs. NO ADDITIONAL GUARANTEE IS EITHER IMPLIED OR EXPRESSED. This boat is made out of jersey cedar (exterior is fiberglassed all around). engine bracket included for your installation if desired; Boat was built in 2005 by Gus Heinrich at the Tuckerton Seaport Museum. It includes a 15hp yamaha outboard engine, as well as hidden oars to assist in the marsh. The entire upper deck has been camouflaged with a 3m sticker. Some areas have been worn due to use and can be easily replaced. Lockable hatch cover. The flat bottom allows for shallow water maneuverability. 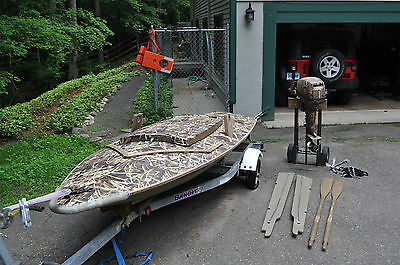 The package includes the sneakbox, engine, 5 gallon tank, anchor, lifejackets, wooden planks to stick reeds into for increased camouflage, trailer, stern and bow lights, and motor arm attachment. We are selling the boat because we don't use it anymore and hope someone else can enjoy it. You are bidding on a wooden boat hull designed after the Italian Riva Rama speed boat. This will be an exciting project. What you see is what you get: the wooden body, which is made of cedar and purple heart, stainless steel hardware and accessories, unwrapped Plexiglass windshield, leather seating. The hull is cover under fiberglass cloth. There are a few damages to the hull that I can see when looking up close: 1. On both sides of the swimming platform, there are two areas that you can see the fiberglass cloth slightly pop up (4x4 inches each)2. At the port bow section, there is a shallow 1/2 inch dent3. There are a few more areas that you can see whiten fiberglass. To make it mirror effect, you may need to repair above damages and add a few more vanish coats.Of course, you need to add engine (V-Drive), props, and everything else to make it the ferrari of the seas (or lake). Pick up locally in City of Industry, CA. Or call for a shipping quote. It comes with an used tandem trailer (with title). The owner has spent 35k+ for this project, but it's time to transfer to a luckier one. 1936 Dual Cockpit Vintage 15’ Wooden Boat “Miss Bert” Historic connection to Pasco Tri-City Kennewick areas, WA Vintage Hydroplane & Racing Boats on the Columbia River This 1936 historic wooden boat was named in the 40’s as “Miss Bert” after the original owner’s wife, Roberta. It has been passed down through 2 families, and enjoys the racing history of the Tri-City area on the Columbia River of Washington State. This has always been a fixture to the area, only used fresh water. This is a 1936 Mahogany Dual Cockpit boat built with copper rivets. The copper rivets were known to be used in custom Reinell, and other area quality built boats. 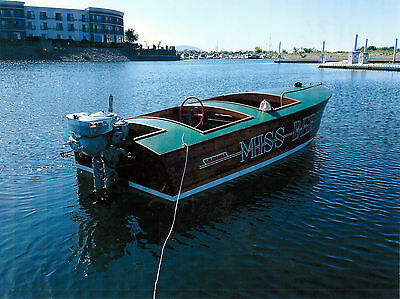 The actual maker of this custom boat is unknown, but believed to be from the Puget Sound area. Mahogany was the top grade material used for the era. The side name & painting is original and vintage to this historic boat, this is not a recreation! You can tell the condition, boat has very low hours. There is no rot and all wood, seats, everything is original. Boat has always been kept on the trailer in heated garage type storage. HISTORY: In the 1970’s the boat was refitted with a newer motor and side throttle controls. The original 1937 Johnson Seahorse 22.5 HP motor was placed on a stand in the heated boat garage where it sat for decades. During the last decade, the low hours & original Johnson Seahorse 22.5 HP outboard motor was freshened up and polished and replaced onto the boat. It runs strong & fast.... I was told mid to high 30 mph ranges for the sleek & light weight boat. The Johnson outboard is a unique 2-cylinder with compression bleed off of one cylinder for easy starts. It also has a built in flush port for water hose. It turns over easily, but was drained of gas and winterized a few seasons ago. The steering wheel is active for the outboard. Boat has lived its life in the sunny & dry desert areas of Eastern WA. Sale of this vintage boat includes the original 1937 Johnson Seahorse Outboard with brass propeller. It also includes the vintage wooden trailer. Both boat and trailer are licensed and currently titled. Vintage trailer is in excellent condition and ready to tow anywhere. Boat and trailer were recently towed hundreds of miles from Tri-City areas to Seattle, WA, where it is presently garaged. TERMS OF SALE: Initial Paypal payment due upon end of auction. Balance due seller within 5 days, unless prior terms approved by seller. 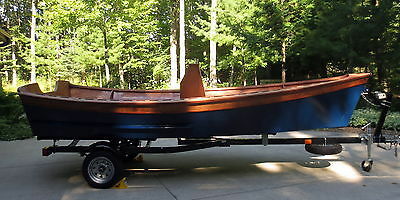 This is a vintage wood boat sold as-is without warranty by seller. Any vintage vehicle or boat should be inspected prior to purchase. Buyer responsible for hauling, all transport costs from Seattle, WA. Transport may be very inexpensive as posted on UShip as many travelers & small haulers can hook up the hitch behind their rig and off they go. This is a great deal as ASKING PRICE OF THIS BOAT is NOW just 1/2 of estimated value for final estate type of sale! Call with questions... I do collect cars & more :) 206-650-6100Thanks for L@@KING & Good Luck Bidding! 1936 Dual Cockpit Vintage 15’ Wooden Boat Historic connection to Pasco Tri-City Kennewick areas, WA Vintage Hydroplane & Racing Boats on the Columbia River This 1936 historic wooden boat was named in the 40’s as “Miss Bert” after the original owner’s wife, Roberta. It has been passed down through 2 families, and enjoys the racing history of the Tri-City area on the Columbia River of Washington State. This has always been a fixture to the area, only used fresh water. This is a 1936 Mahogany Dual Cockpit boat built with copper rivets. The copper rivets were known to be used in custom Reinell, and other area quality built boats. The actual maker of this custom boat is unknown, but believed to be from the Puget Sound area. Mahogany was the top grade material used for the era. The bottom has been glassed over and is rock solid. The side name & painting is original and vintage to the boat, this is not a recreation! You can tell the condition, boat has very low hours. There is no rot and all wood, seats, everything is original. Boat has always been kept on the trailer in heated garage type storage. HISTORY: In the 1960’s the boat was refitted with a newer outdrive and side throttle controls. The original 1937 Johnson Seahorse 22.5 HP motor was placed on a stand in the heated boat garage where it sat for decades. During the last decade, the low hours & original Johnson Seahorse 22.5 HP outboard motor was freshened up and polished and replaced onto the boat. It is a 2-cylinder with compression bleed off of one cylinder for easy starts. It also has a built in flush port for water hose. It turns over easily, but was drained of gas and winterized a few seasons ago. The steering is active for the boat, and throttle is presently on the outboard as it was originally done back in the 1930’s. It has an electrical connection to add a side mount throttle control if desired. Boat has lived its life in the dry desert areas of Eastern WA. Sale of this vintage boat includes the original 1937 Johnson Seahorse Outboard with brass propeller. It also includes the vintage wooden trailer. Both boat and trailer are licensed and currently titled. Boat is titled as 15’ and I measured just over 14’-6” from bow to stern. Trailer is in excellent condition and ready to tow anywhere. Boat and trailer were recently towed hundreds of miles from Tri-City areas to Seattle, WA, where it is presently garaged. TERMS OF SALE: Initial Paypal payment due upon end of auction. Balance due seller within 5 days, unless prior terms approved by seller. 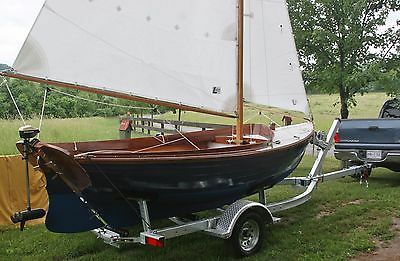 This is a vintage wood boat sold as-is without warranty by seller. Any vintage vehicle or boat should be inspected prior to purchase. Buyer responsible for hauling, all transport costs from Seattle, WA. Transport may be very inexpensive as posted on UShip as many travelers & small haulers can hook up the hitch behind their rig and off they go. Thanks for L@@KING & Good Luck Bidding! The hull appeared to be in good condition for the age. The wooden hull is White Cedar. Over the years the bottom has been repaired and refastened. Bilge areas aft of amidship was not viewed The deck was solid all around with normal wear. Rub rail starboard amidship is damaged (see photo) Gunwale and Deck Railing all appeared secure. The engine is the original Detroit 6-71N. The engine is currently winterized. Water pumps were not tested. All new wiring for Water Cannons Inverter and 30AMP Converter are newer (not on board). 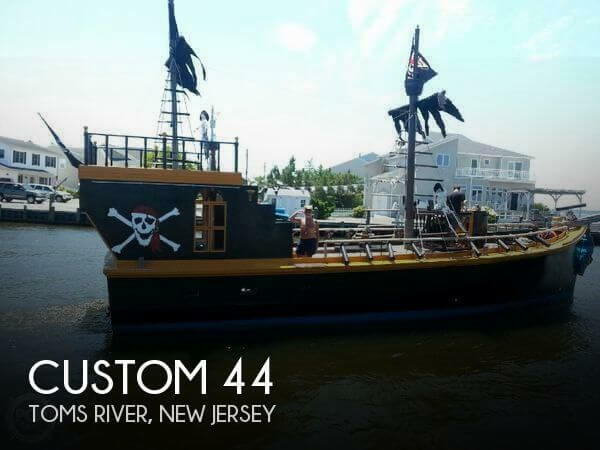 Stock #133287 1961 CUSTOM PIRATE SHIP ; GREAT BUSINESS OPPORTUNITY If you are in the market for a passenger boat, look no further than this 1961 Custom Pirate Ship, priced right at $179,000 (offers encouraged). 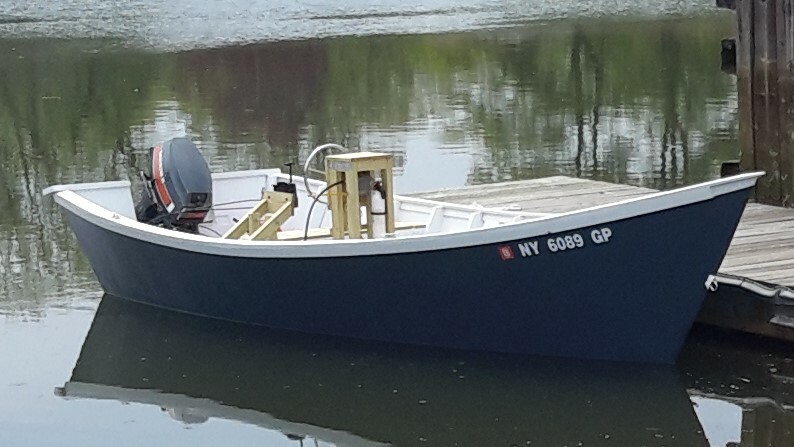 This vessel is located in Toms River, New Jersey and is in decent condition. She is also equipped with a Detroit Diesel engine. Reason for selling is retiring. Specifications: LOA 16'; DWL 12'6" Beam 6'1" Draft 1'6" Displacement 1,389 lbs Sail Area 134 sq ft This boat was custom built and sailed only one season.With 550 lbs lead ballast and 20 lbs in center board, she is a delight to sail. 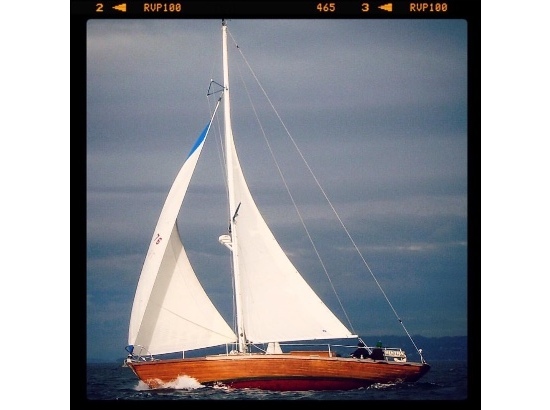 Very easy and stable for beginner or experienced sailor. . With Mahogany trim, seats, floors and transom, she shows off very nice. The mast is Sitka Spruce and handles easily. 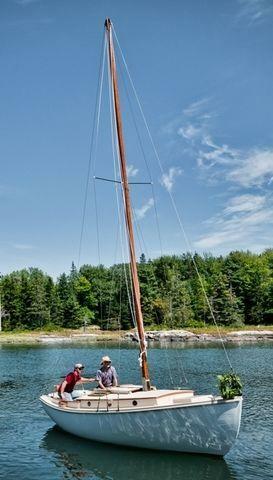 This design is very similar to the famous Herreshoff 12 1/2. The custom trailer is galvanized, and she tows easily by a standard sedan, no need to have a truck. NO RESERVE WHAT AN ADVENTURE!!! 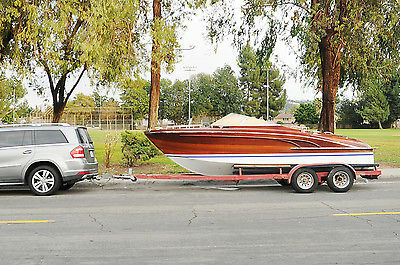 CLASSIC 1958 CHRIS CRAFT 17 ft on CUSTOM TRAILER Enter the "Trop Mignon" which means "Too Cute". Originally from Michigan. Clean title. Now in Vermont so with VT letters - fully registered through 2014 on a permanent custom trailer with recently adjusted axle, to make it a pleasure to trailer. She is a gorgeous 17 foot 1958 marine plywood Chris Craft boat that has had extensive restoration over the last several years. Thru hull exhaust. Appears to have been an early prototype because she is configured as a Sportsman with chrome everywhere. Owned by a meticulous collector. Stored indoors always on custom trailer, except for Summers. Great cruising this season. PHOTOS IN THE WATER ARE FROM THIS SEASON! Restored professionally - near mint top deck ($7,500 job) and sides ($5,000). Bottom has had 5200 added in spots that were needed. Interior has excellent leather patina including all functional chrome gauges. Hairline crack in very solid block does not impair performance. New carb, new points, new plugs. Water pump just gone thru and refurbished. Beautiful brass propeller. Beautiful split windshield, new gas tank (plastic) under two stern seats. Chris Craft bow flag. USA flag for stern with built in stern light. Professional transom letter job. Professional use of marine screws where needed. All gauges were removed, rechromed or polished as needed, and returned to dash during top deck restoration. Beautiful bow lights. Rumbles in the water like a good ol' Riva ought. Attracts attention everywhere. Trailer is custom and has a vintage look that matches the color and patina of the boat. Have towed over 1k miles without issue. Tires are fine, bearings on left side need to be repacked. Will try to get to that this week. Has an off the shelf canvas cover in blue with lattice. A thrill to drive and the only way to see the lake and mountains the way they were seen in the 1950s. Auto bilge fully functional. Extremely fuel efficient. Cruises at 2500-3000 rpms. Engine cover is made of oak with a leather top - may want to redo in mahogany. Will eventually want to add fiberglass strips to the seams on the bottom. The original fiberglass over marine wood was a new design that could be improved by reglassing the seams to over the ribs. Small crack port-side windshield just happened due to rain gathering and making cover too tight - easy fix. Horn is LOUD. Spot light in chrome is decorative only. Original inline 6 engine fully functional at 80lbs pressure. One area on side was just expertly repaired using hand planed mahogany painted over with 3M-5200. Needs a painted stripe. Overall (+++) Beautiful boat that an enthusiast would enjoy restoring to its show potential, or just having a cruising boat that looks like $1 Million! Attending to the moderate needs described above would bring it to a much higher value should you ever wish to sell her. No Spam please: feel free to call afternoons EST with any questions: 802-777-3317. Seller reserves the right to end auction early, or to sell outside of eBay. Selling AS IS and WHERE IS with no warranty implied or expressed. Freshwater use only. Has been a thrill to own. Grabs attention everywhere. Sits low to the water with the thru-hull exhaust that rumbles so splendidly. Carves through the water. Feels like you are a Kennedy. Only thing missing is a cigar. But she even has a built-in original cigar lighter.